4 What Determines the Fiscal Impact of Immigration? 7 What is Missing from the Current Analysis? Chapter 18: Migration, International Trade, and Capital Formation: Cause or Effect? Chapter 21: Immigration: What About the Children and Grandchildren? 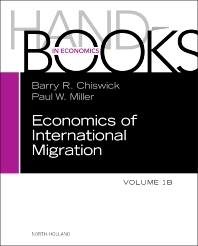 The economic literature on international migration interests policymakers as well as academics throughout the social sciences. These volumes, the first of a new subseries in the Handbooks in Economics, describe and analyze scholarship created since the inception of serious attention began in the late 1970s. This literature appears in the general economics journals, in various field journals in economics (especially, but not exclusively, those covering labor market and human resource issues), in interdisciplinary immigration journals, and in papers by economists published in journals associated with history, sociology, political science, demography, and linguistics, among others. Covers a range of topics from labor market outcomes and fiscal consequences to the effects of international migration on the level and distribution of income – and everything in between. Graduate students and professors worldwide working in all subdisciplines of economics and finance as well as those working in population studies, demography, governmental policy, sociology, and related fields.